The rippling heat waves rising from the running trail at Palisades Park in Santa Monica looks more like something you'd see in Vegas, where people joke about frying an egg on the sidewalk. The coast is supposed to be the place that helps beat the heat but lately, locals and visitors both say there hasn't been much relief. The Cooper family made the drive from Encino, hoping to cool down for Labor Day. "We noticed on the drive over, we watch the temperatures go down usually," said Jenny Cooper. "The last couple weeks, strange, it stayed around 90 as we were driving from Encino to Santa Monica." 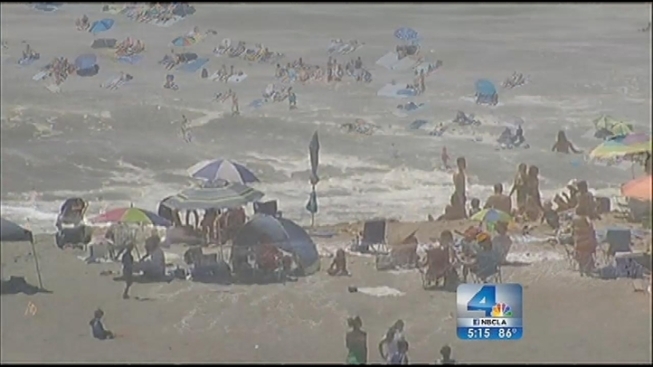 What the Coopers are noticing is backed up by a study out of the Scripps Institution of Oceanography in San Diego, which says heat waves will be increasinly making their way toward the coasts, long a refuge from sweltering summer temperatures. The study predicts global warming will cause hotter conditions along Southern California's coastline through the rest of the century, bringing with them higher humidity and warmer nights. "I do think it’s starting to get hotter and hotter, even in the beach area," said Valley Village resident and frequent beachgoer Patti Clark. "This summer it did. The nights were hot here, too, where normally you’d come here and escape and have it 15 to 20 degrees cooler, but that’s not really happening lately." Trying to stay cool during extended heat waves can put a strain on the power grid and the bodies that have to endure the rising temperatures. Living along the coast poses special challenges since homes are not built for heat and many don't have air conditioning. "It’s fine until it gets hot," said Santa Monica resident Jason Carpenter. "We’re on the second floor under a flat roof, a lot of direct sunlight, so once it's over 80 or so, it gets pretty steamy inside." If the research holds up under scrutiny, and it's bound to get some because of its reference to global warming, we could expect a rise in heat-related health problems and higher demands for energy in a place that usually goes easy on the AC. But some coastal residents say, wait a minute, this is still SoCal. "I like my 72 and sunny," said Santa Monica resident Devon Chivvis. "I don't like it a degree over that, and this is very hot, but we can't really complain, can we, since the rest of country has been tortured all summer."